There’s an interesting post over at the French site blogeee.net today. They’ve put the latest AMD E-series Fusion platforms up against the new 1.8Ghz ‘Cedar Trail’ N2800. It’s not exactly fair to be comparing the E-series with Cedar Trail like for like as they have vastly different thermal characteristics but there’s an interesting result to be seen in the GPU test results. The new PowerVR-based graphics in the Cedar Trail platform are turning in 3x what the N570-based platform does. That’s excellent news. As far as raw CPU power goes the tests don’t show any comparison but I would expect the dual-core Cedar Trail platform at 1600mhz to be about the same as the E450. The 1.8Ghz N2800 should turn in better CPU performance. With the N2800 having a design rating of 6.5w and the E-450 at 18W you can see which one has more chance of appearing in smaller, lighter devices. One wonders if it might be a better choice than Oaktrail for Windows tablets. ..Steve, i can record fullHD vids on my Samsung Galaxy S2 and fullHD vids on my Sony digital Cam at 1920×1080 @50fps. I most probably would go for E-450 as even Nvidia GeForce GT 130M has troubles with those vids. I can live with 1 or 2 hours less battery life, but when the laptop or another devices needs to deliver, with E-450 it can, the other platforms won’t. So basically I cannot even consider them. Ok 1080p playback. In theory cedar trail will handle that, at 50fps though, I’m not sure. I recall reading 35mbps somewhere though. The blogeee article did state that neither the E-450 or the N2800 drivers were fully optimized yet. So they probably got access to some prototype test results. 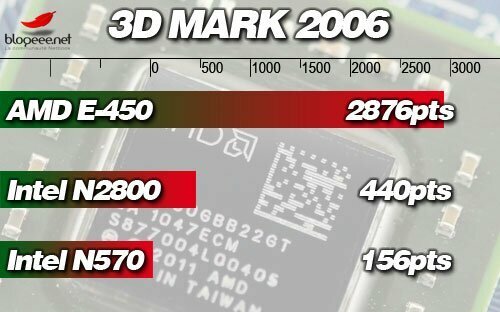 However, even Ontario AMD Fusion GPU scores are much higher than Intel GMA and the E-450 should be noticeably better. So the performance gap should be largely accurate. 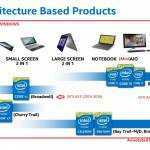 While Intel has been promising Cedar Trail would have at minimum double the performance of the GMA 3150 and it looks like that’s what we’ll be getting, driver stability notwithstanding of course. The power rating of 18W includes CPU/GPU/memory controller in AMDs APU. 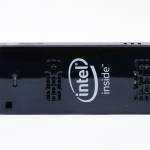 While Intel systems will be adding GPU and memory to their power rating. Correct? Actually, no. Pine Trail, The second generation Atom for Netbooks, integrated a GMA 3150 core and memory controller on the same die as the CPU. Cedar Trail is the successor to that. Now, you do still need a I/O chip, but that’s a different story. Zacate has a 9W smaller brother called Ontario, Pine Trail has 6.5W single core versions and Cedar Trail will have lowered clocked dual core with 3.5W. DavidC1’s points are correct, though the Intel NM10 has a max TDP of 2.1W and the 1.5W is more a average. There are also X factors to consider, like the more powerful GPU of the AMD Fusion means they’re more likely to be coupled with HD screens, which will use more power than lower res screens, along with costing more, and is one of the reasons why 1024×600 resolution screens still dominate the 10″ screen market. 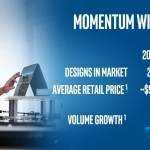 Though the industry is making some progress on improving screen power efficiency and we may start seeing them in models next year, along with the general push for HD resolution throughout the entire spectrum of products to help speed the process. However, this likely means Cedar Trail systems will have significantly better run times. Though that comes at the cost of some graphical performance, even provided there are no issues with drivers, but should mostly be in the 3D graphics performance arena as the PowerVR GPU supports hardware video acceleration for most formats and barring any issues with drivers should support even Blu-Rays and full HD youtube just fine. Another X Factor is system optimization, as the TDP mentioned are for the max and depending on system optimization they can be significantly less, especially if max performance is not needed all the time. Like the tablet specific version of the C-50, renamed Z-01, has a lower 5.9W max TDP. Accomplished by removing support for multiple ports, which isn’t needed on tablets, and reducing the idle CPU clock speed even more. Along with similar power saving measures to the FCH. While performance is reported to still be equivalent to normal C-50 in most benchmarks. So minimum power usage can be pushed a bit and still give good performance, but will depend on application and how much effort the manufacturer puts into optimizing the final product. Yes not games but why not at least zero lag Flash video and maybe some WebGL games so far looking good for AMD.